It's been well over a week since I release version 1 of the jqMock library, and I've finally finished the documentation including the jqMock user guide, which is pretty comprehensive. It has all the trimmings of your standard mock library, although I'm quick eager to wait for comments on what people think of the different approach to mocking, and whether this library is useful for everyday unit testing usage. Please have a look at the code, do some code review, and leave some comments! Using the jquery QUnit test suite as my benchmark, I've been trying make the tests pass. The going has been tough, with countless nuances to fix up, but I managed to pass the 1.1.4 core tests, and the 1.2.6 ajax and event tests. However, now stumped on the 1.2.6 core tests and realising that I won't ever have enough spare time to implement full CSS support, I'm going to blog about other areas which I've been successful with. One change that made a big difference was the additional of a global eval. This means adding script elements will evaluate them in the global scope, and ajax loading of dynamic scripts with ajax now works as expected. This mechanism allows you to mimic browser behaviour much more closely, and load the scripts defined in the HTML file (like a real browser) rather than a separate js file to load the unit tests. Doing that also allows you to fire the document ready event at the right time. More on this in my next post. After finishing my blog entry Liferay Session Sharing Demystified, i found a forum post which pointed to the liferay Jira of LEP-2297. Turns out Liferay 4.3.x has built in support for running servlets from within the Portal context! Yes... yet another wonderful but undocumented feature in Liferay. In a nutshell, you configure your servlet to register itself with the built in PortalDelegatorServlet. This servlet (in the portal’s context) makes a cross-context call to your servlet, and provides your servlet with the portal session. The example configuration in the Jira is based on the code that was submitted, so here is an example based on the Liferay’s distribution. In your servlet’s web.xml file, configure the following servlet. This example registers your servlet example.FooServlet under the key foo.do. (If a sub-context is not provided, the servlet-name will be used as the key instead.) When a request is made to /delegate/foo.do , the PortalDelegateServlet will process the URL, lookup the key foo.do, find your servlet, and make a cross context call to your servlet to run the service method. If you don’t like the /delegate servlet-mapping, you can change this in the portal’s ROOT.war web.xml. One confusing thing is that the sub-context is used as the key to store the servlet, while only the first token of the URI is used as the key to lookup the servlet. Which means if you try to set the sub-context to myapp/foo.do then navigate to the URI of /delegate/myapp/foo.do , it won’t work, because the PortalDelegateServlet will attempt to lookup the map using the value myapp, and find nothing. Bottom line: the sub-context must be only single level deep. You will need to be careful if you are using third party libraries like Spring. These libraries don’t expect you to be invoking a cross context call, so anything can happen! For example, when wiring up the Spring DispatcherServlet, writing directly to the response output was fine, but returning a ModelAndView didn’t work. Further investigation revealed that InternalResourceViewResolver was looking in ROOT.war to resolve the location of the view. Which means if the prefix was /WEB-INF/jsp/ , you would have to put this inside /ROOT.war/WEB-INF/jsp , which is clearly not workable. However, servlets are usually deployed in the portal is to enable some sort of file download, which requires you to write directly to the response output stream anyway, and for this use case the PortalDelegateServlet is the perfect tool. Liferay’s session sharing mechanism has always been a bit of a mystery. As with most things Liferay, documentation is minimal, and leaves a lot of questions to be answered. I’d like to share with you what I’ve learnt after testing a bunch of scenarios, and hopefully this will be good reference material for all of you developing portlets on Liferay. 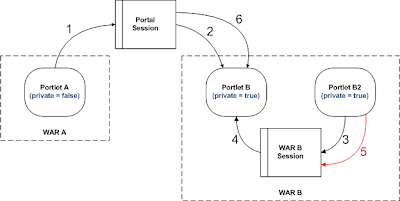 My scenarios focus on how Liferay’s sessions behave for different combinations of the private-session-attributes settings; between the portal, portlets (in the same WAR, and across different WARs) and the servlets in these WARs. This also means that only APPLICATION_SCOPE attributes are relevant to the discussion. Testing was performed on Liferay 4.3.6, and consisted of basic JSR-168 portlets , and basic Servlet Spec servlets. To emulate code running in the portal scope, a simple servlet Filter was configured on the Portal application. This is the default setting, in which each WAR has its own session. The session within each WAR is private, and nothing is shared between individual WARs. 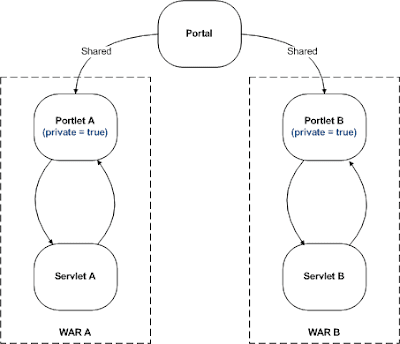 Portlets and Servlet within the same WAR file will be able to share the session, because they are in the same context. So far, this conforms to the Servlet spec. Liferay provides an additional functionality under this setting. As the official FAQ states, it also allows shared (namespaced) attributes set by the portal to be visible from portlets. Any session attribute with the configured prefix (e.g. LIFERAY_SHARED_) will be copied over and be visible by the portlets, hence granting private portlets read-access to session attributes set by the portal. This is illustrated in diagram 1. All portlets under this setting will share the same session, and also share this same session with the portal. This is the easiest way for portlets in individual WAR files to communicate with each other. However, the downside to this is that servlets in these WAR files will not be able to communicate with the portlets at all. (This is a question often raised in the forums, and one I struggled with for a while to figure out). The most convenient way to think of this is that portlets with this setting use the portal session, and have no access to the WAR session. This is illustrated in diagram 2. 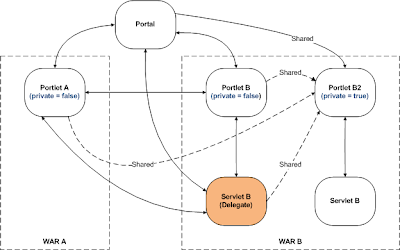 Diagram 3 depicts the interaction between a private and non-private portlet in individual WAR files. 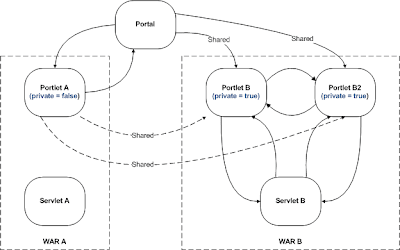 Portlet A, being non-private, has full communication with the portal, but cannot talk to Servlet A. Portlet B, being private, has full communication with Servlet B, but only has read-only access to Portal shared attributes. You will notice arrow from Portlet A to Portlet B is dotted because this communication happening indirectly through the portal session. 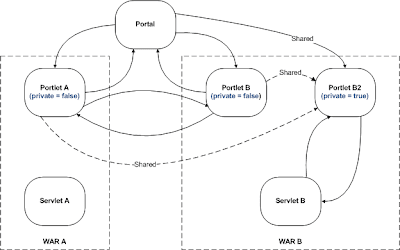 Portlet A is using the portal session, so any shared attributes that it sets will also be copied over to Portlet B, and can be read. 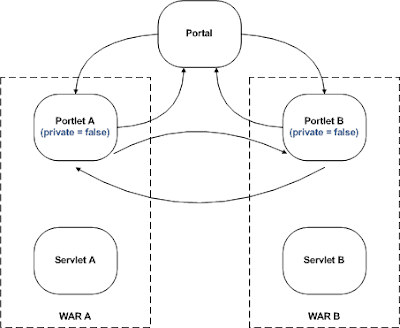 Diagram 4 expands on diagram 3, and adds another private portlet to WAR B. Both of the portlets in B are private, meaning they are using the WAR session, so they can freely communicate with each other and the servlet. Same as the previous example, they will be able to read shared attributes set by the portal, or by any non-private portlet like Portlet A. Diagram 5 is a bit more interesting. Here, Portlet B has been changed to non-private, meaning it will use the portal session. That is why it can now freely communicate with the portal and Portlet A. However, just like anything else using the Portal session, it cannot read the WAR session of B anymore, even though it is in the same WAR! While this may seem a little counter-intuitive, it is consistent with the behaviour we have seen so far. Update: Liferay has a built in mechanism for calling servlets from the portal context, giving them access to the portal session. You may have noticed so far that the servlets cannot directly read the shared attributes of the portal session. But you can get around this by using a private portlet as a proxy. 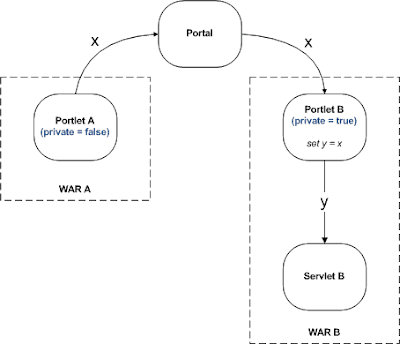 Diagram 6 shows the flow of how a shared attribute x, set by non-private Portlet A, will be stored in the portal session and subsequently copied to private Portlet B. Portlet B, having write access to WAR session B, can set another attribute y to the same value as x, and y can be read by the servlet. Overwriting shared attributes from private portlets? We know that any session attributes set by private portlets cannot be seen by the portal, or by any other non-private portlets. But what happens if the private portlet sets an attribute of the same key as the shared attribute? Non-private Portlet A sets a session attribute LIFERAY_SHARED_foo to “alice” . This is stored in the portal session. Private Portlet B reads the attribute LIFERAY_SHARED_foo. Since this is a shared attribute, it has read access, and returns the value “apple” . Private Portlet B2 now sets the same session attribute LIFERAY_SHARED_foo to “bob” . Because it is a private portlet, the value is written to the WAR session. When Portlet B tries to read the attribute again, it returns the value “bob”. This shows that values in the WAR session override those copied from the portal. If at this point Portlet A were to set the attribute again, Portlet B cannot see the change. When Portlet B tries to read the attribute again, it returns the value “alice” from the portal session. This example shows that when private portlets tries to read an attribute, it will first read the attribute from the WAR session. If it can’t be found, it will try to read from any shared attributes copied from the Portal session. Non-private portlets read and write to the Portal session. Private portlets write to their own WAR session. Private portlets try to read from their own WAR session first, then looks up any shared attributes copied from the Portal session. Servlets only have access to the WAR session, and cannot directly access the Portal session. 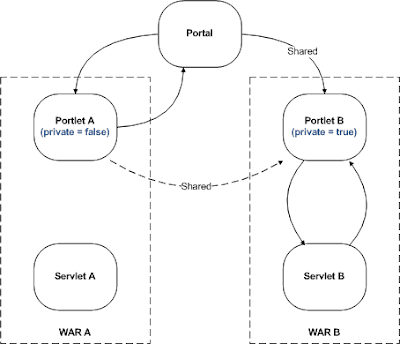 In order to read shared session attributes, servlets need a private portlet in the same WAR file to copy it for them. Or you can configure your servlet to use the portal session by using Liferay's PortalDelegateServlet mechanism.